Frank Brusca has been working on a book of current photographs of the places Stewart photographed n the early 1950’s for his book, US 40. Things look promising for Frank’s book, and we expect to be able to post big news about it soon. I’ve just put two new links in the header menu: One will take you to the Stewart Collection at the University of Nevada, Reno. The other, to the finding aid for the extensive collection of manuscript material held by the Bancroft Library at the University of California, Berkeley. Hope you enjoy perusing those collections. Steve’s recordings of various people involved with George R. Stewart’s work and life are available at the Bancroft. Thanks to Steve’s generosity, they’re also available in the George R. Stewart Collection at the Special Collections Library of the University of Nevada, Reno. UNR has the second largest public collection of Stewart’s work. Click on the link in the header menu to see their collection. Email from McFarland today. Content editing is done. Now they’ll work on page design, layout, corrections. The Big Job ahead for me is doing the index…but it shall be done. 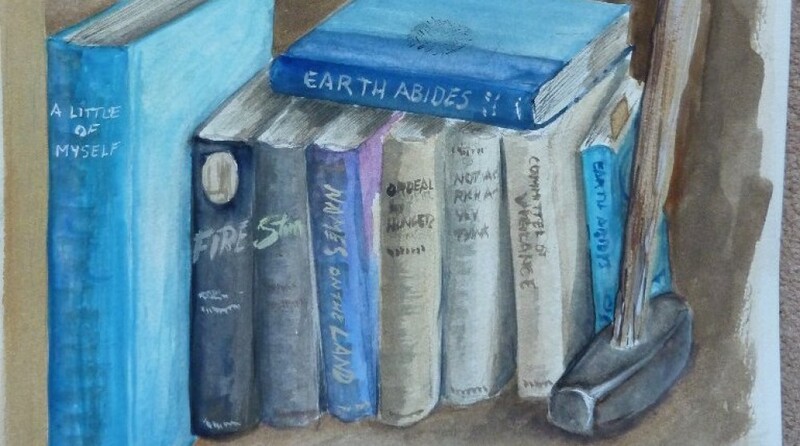 The painting used as the header for the blog is the work of gifted artist Stephen Williams. Steve attended the Liverpool Institute of Art (with John Lennon and Paul McCartney), took a detour from his art so he could raise his family. Now retired, Steve has returned to his art with great success — he’s done work for Bletchley Park, won an award for his work, and is now the Regional Coordinator for the Society for All Artists. Steve is also a Stewart scholar; we’ve worked together on Stewart projects for decades. He lives in England, with his wife and family. Due to size limitations on the header it’s not possible to show Steve’s painting in its entirety. So as soon as I’ve got WordPress figured out I’ll display the entire painting. Enjoy the pre-Christmas week, and the end of a special year — the Year of Palindromes. The Day after Beethoven’s Birthday and a week before Christmas Eve, a gift! The George R. Stewart biography is now available for pre-order at McFarland or Amazon. It’s the first authorized biography, the work of years of research and writing.